In this chapter, I run front, I run back, I run inside out, and then I run front and back. Jennifer and I loved Big Hero 6. It was a great movie with fun characters and a pretty mature plot for a superhero cartoon. And we didn’t get though the closing credits before we first started talking about which characters we might want to cosrun. 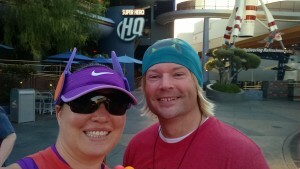 Early on in the planning for our year of runDisney, we were thinking about Guardians of The Galaxy characters for our Avengers 10K costumes, but after seeing BH6, it became a much harder decision to settle on costumes. 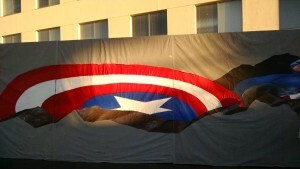 I knew I was going to do Winter Soldier for the Avengers Half Marathon, but was still undecided on my 10K costume. Ultimately, we felt BH6 characters would make better running costumes and began narrowing down our choices. I weighed all the options and finally decided on Fred. Not only is he a fun character, but his plain clothes outfit was memorable, recognizable, and would make a good running costume. Putting the design together for Fred was actually pretty easy (creating the graphics was the only thing that made this costume complex); it was mainly a matter of finding the right clothing. 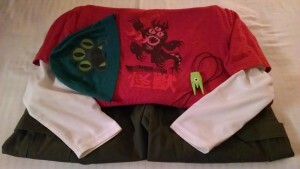 I already had a pair of khaki green shorts from my Admiral Piett costume, so I needed a faded red shirt and a teal beanie (which I would create and add graphics to) and a long sleeve white undershirt. I would also need to fabricate an alien necklace out of craft foam and find a wig that would work for the costume. 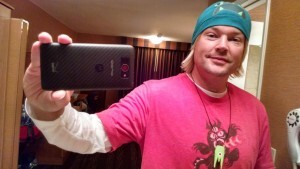 I found shirts, beanie, and a wig online and put in the orders. I also picked up a few extra packs of dark t-shirt transfers for the shirt graphics at the local craft store. I already had some green craft foam laying around to use for the necklace. I was really excited about this costume, so I got started right away. I had the graphics for Fred’s shirt and hat done in a day and turned my attention to other pieces. My first attempt at Fred’s alien necklace was just one piece of green craft foam folded over once and glued. I used colored pens to draw on the eye and freckles, then I set it aside. A few weeks later, I gave it another look and decided I could do a better job. I wrapped another layer of foam around it, to give it more thickness and weight, painted on the eye and freckles to give it a much more authentic look, and I was much happier with how it turned out. Once the shirt and hat arrived, I did a few test prints of the graphics to get the colors right. Check out my Lightning McQueen article for more details about printing, cutting, and ironing on t-shirt transfers. When the wig arrived, it was a little longer than I needed, so I trimmed it to the length I wanted. The only trouble with jumping in and getting a costume done early is waiting for the race. I got impatient, so when Halloween rolled around, I took the opportunity to give Fred a dress rehearsal. In keeping with all our other Disneyland races this year, the weather was absolutely perfect. Think what you will about California: the traffic, the taxes, the earthquakes. But, I get why people live there… the weather is amazing. Jennifer and I usually run 10K races together. Since I was still nursing a foot injury and had a half marathon the next day, I knew I was going to walk this one. Jennifer was nice enough to walk it with me. As expected, her Honey Lemon costume stole the show. In my opinion, her bag is one of the best costume pieces I’ve created up to this point and it got a ton of attention and compliments. But, as the sun came up and I was no longer out shined, Fred got some love of his own… quite a few shout-outs on the course. This was one of my personal favorite costumes and I enjoyed every part of the process. And even though I had to walk this one, it was still a lot of fun. We all have our own motivations for running, but most of us do it because it’s fun. And running in costume only adds to the fun. Coming up with a costume idea and putting it all together is a fun project in itself, but it also increases the excitement leading up to race day. And since you have to register for a race months ahead of time, working on a costume can help fill a few of those hours when you’re not out on a training run.